Zion Market Research has published a new report titled “Soft Tissue Repair Market (Mesh/Tissue Patch, Soft Tissue Fixation Devices, Laparoscopic Instruments and Others) for Skin Repair, Orthopedic, Hernia Repair, Dental, Breast Reconstruction Repair and Other Applications: Global Industry Perspective, Comprehensive Analysis, Size, Share, Growth, Segment, Trends and Forecast, 2015 – 2021” According to the report, the global soft tissue repair market was valued at around USD 11.15 billion in 2015 and is expected to reach approximately USD 17.12 billion by 2021, growing at a CAGR of around 7.5% between 2016 and 2021. Soft tissues in the body include ligaments, tendons, skin, and synovial membrane which are support, connect, or surround other structures and organs of the body. Soft tissue injuries are segmented into the time frame since the injury and the healing processes that are occurring at that time. In repair, damaged tissue is replaced by granulation tissue which matures to form scar tissue. Soft tissues are highly deformable and its properties vary significantly from one person to another. Soft tissue injuries are the most common injury in sport. Soft tissues repair market is expected to witness significant growth in the coming years owing to increasing geriatric population coupled with rising healthcare expenditure. Moreover, increasing the popularity of sports like football, basketball, and tennis there has been a significant increase in the number of soft tissue injuries arising from these games. The increasing number of soft tissue injuries due to sports is further anticipated to fuel the market for soft tissue repair in the near future. However, the high cost of treatment and an ambiguous reimbursement scenario are expected to hamper the market growth within the forecast period. Nonetheless, rising trend of minimally invasive procedure and technological advancement in orthopedic surgical products may open up new growth opportunities in the years to come. 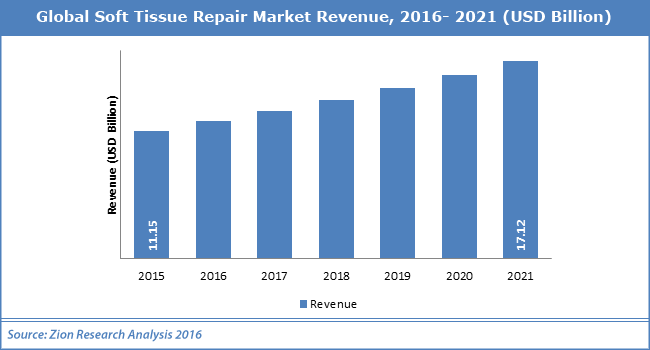 The soft tissues repair market is segmented on the basis of products into tissue patch/mesh, soft tissue fixation devices, and laparoscopic instruments. Tissue fixation product market is expected to exhibits significant growth in the years to come on account of to its ability to preserve the tissues from decaying and growing the mechanical strength of the tissue. The laparoscopic instrument is another key outlet of soft tissues repair market. Based on application, soft tissue repair market is further segmented into skin repair, orthopedic, hernia repair, dental, breast reconstruction repair and others. In terms of revenue, skin repair was the largest segment in 2015. This growth is mainly due to skin ability to heal itself and help in generating new tissue. Skin repair is expected to witness the fastest growth in the year come. Orthopedic was the another leading segment in 2015 due to the significant increase in the number of soft tissue injuries arising from sports games such as basketball, soccer etc. The soft tissue repair market was dominated by North America with the largest share of the total revenue generated in 2015. The rising demand for treatment from the aging population coupled with increasing healthcare expenditure especially in U.S. For instance, in 2013, more than 200,000 anterior cruciate ligament reconstructions performed in the U.S. Thus, North America is expected to show lucrative growth within the forecast period. North America was followed by Asia-Pacific in terms of revenue in 2015. Growth in population and advanced healthcare facilities are expected that the Asia-Pacific will witness the fastest growth in soft tissue repair market in the near future.